Detailed street map of Puerto Vallarta and surrounding areas including Nuevo Vallarta (up the coast) and into Nayarit to just past Cruz de Huanacaxtle. 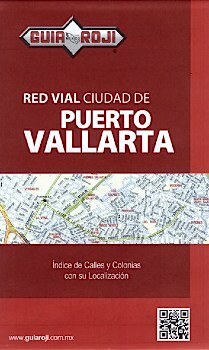 Includes an inset map of Puerto Vallarta city center. An inset map of the region surrounding Puerto Vallarta is also included (scale 1,000,000). Also included is an index of streets and colonias. Scale 1:20,000. 2nd ed.